The world loves Ireland, whether it’s the global party St. Patrick’s Day, iconic Guinness stout, or its unique and pioneering election system. Friday is the European republic’s general election, so here are 9 reasons why Ireland's election system is (probably) the best in the world. In just a few weeks, Ireland will celebrate the 100th anniversary of the 1916 Rising, an armed insurrection against British rule which (eventually) led to an independent republic. The 70 percent turnout in modern elections is a way Irish people honor the sacrifice of those who died before them. Whoever wins this election will get to relish in a period of nationalism and pride among Irish people. During the height of war that followed the Easter Rising, an innovative new system was developed to address the nascent democracy’s political diversity. Proportional representation through single transferable vote, otherwise known as PR-STV, started in 1922. Since then, STV has been adopted by countries such as New Zealand and cities like Cambridge, Massachusetts. The system allows voters to rank their candidates in order of preference, thus greatly reducing the number of spoiled votes found in a “first past the post” system. It also gives more access to small parties and independents. The economic crash of 2008 and ensuing austerity measures meant a new voice emerged in the form of parties and alliances that claim to represent those who cannot afford cuts and additional charges. With names like People Before Profit, the Anti-Austerity Alliance, and Direct Democracy on Ireland, their candidates are gaining traction and could be a key part of a left-wing minority government, similar to those recently elected in Spain and Portugal. While the Irish parliament (Dáil) technically has a dress code, a few sitting members and hopeful candidates let down their long hair and ditch the suits. Sitting member (TD) Mick Wallace is famous for his white flowing mane and brightly-colored shirts. NAMA from Strawberry Films on Vimeo. Luke “Ming” Flanagan, a former TD who is now a member of the European Parliament, was colorfully named after Flash Gordon’s nemesis thanks to his distinctive, pointy beard. One Green Party candidate in the western county of Clare is professional surfer Fergal Smith who’s trying to ride a victory wave to the capital. While their appearance is casual, they are serious about the country’s finances and facilitation of CIA rendition flights on what is officially neutral Irish soil. Just ten years ago, Sinn Féin leader Gerry Adams was removed from the US terror watch list, after being targeted for his alleged role in the struggle against British occupation in the “six counties”. Today, he’s poised to be the next Prime Minister (aka Taoiseach, pronounced TEA-shuck) if voters decide to shift left. I'm pretty sure the term for him is a "freedom fighter"
While Adams consistently denies ever being a member of the IRA amid constant accusations, particularly by right-wing media outlets, voters may not care - and instead reward the party’s stance against austerity and privatization. Following Tuesday’s “Leaders’ Debate”, he was the most talked about on Twitter and Facebook. Don’t fear the beard. He might be Ireland’s new leader. Gerry Adams - Tell The Three Amigos, Adios 😂😂😂😂 My Mind Is Made Up..... Gerry For Taoiseach!!! Like the end of a Hollywood sports film, the winning candidates in Irish elections are usually lifted up on the shoulders of their most loyal, and hopefully strongest, supporters. It’s not required and will probably end in injury some day soon, but we can’t help but smile at it every time. All of Ireland’s major parties - and most of the minor ones - supported last year’s historic marriage equality referendum. Ranging from center-right to far-left, far-right candidates or parties are rarely elected in the republic, although the same can't be said in the six counties currently called Northern Ireland. The Christian Solidarity Party occasionally runs candidates and a new party is led by a right-wing lawyer named Lucinda “Cray Cray” Creighton, but for the most part, it’s pretty chill on this island. Irish politicians have no problem expressing themselves or shame saying exactly how they really feel, at least about each other. Phelan later defended storming out, claiming she was “tired and hungry.” We’ve all been there, all is forgiven. While the printing industry collapses everywhere else, Ireland sees a massive resurgence in business every couple of years when election candidates are desperate to cover every available lamppost with giant cardboard pictures of their head. 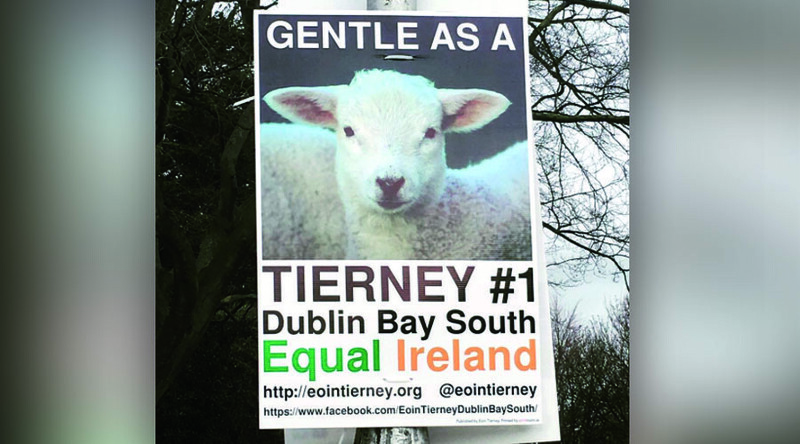 Obviously being Ireland, it wasn’t long before the election posters got imaginative. Don’t be surprised if Kanye West and Barney the dinosaur end up in a coalition government.